Use this option to control the display of icons within the main menus. This option controls whether or not leading zeros will be used when the View | Line Numbers command is in use. This option controls whether or not Boxer will display a pop-up HTML Color Code Hint when the mouse cursor hovers atop an HTML Color Code (such as color="#FF3B80" or color="DarkSlateBlue"). The pop-up box shows the color associated with the color sequence below the mouse cursor. Use this option to control whether or not the mouse cursor will be hidden while text is being entered from the keyboard. If hidden, the mouse cursor will be redisplayed when it is moved. This option controls the way in which a multi-line Stream selection is displayed on-screen. When this option is active, selected lines will be highlighted all the way to the right edge of the window, even when lines are shorter than the window's width. When this option is inactive, selected lines will be highlighted only up to the end of each line. This option has no effect on the text included within a selection. It is simply a display option. Use this option to cause new windows created with File | New or File | Open to be opened in maximized form. This option controls whether or not Boxer will perform Syntax Highlighting while a file is scrolling rapidly, due to a keyboard key being held down. Scrolling will be faster if Boxer is allowed to suspend Syntax Highlighting in this situation. The screen will be updated instantly when the scrolling key is released. Use this option to control whether or not the background of the current will be displayed in a different color. Doing so can make it easier to locate the current line. The Configure Colors command can be used to select the background color used. This option controls whether or not Boxer will apply coloration to URLs and email addresses when they are encountered within ordinary text files. The color and font style used to highlight an address can be controlled with the Configure | Colors command. Disabling highlighting also disables the ability to double-click on these addresses in order to launch an internet browser or email client. In such case, the Open File in Browser and Open Email at Cursor commands could be used instead. Use this option to control the display of the Right Margin Rule, and to set the column at which the rule is displayed. This option controls the number of columns that the Scroll Left and Scroll Right commands will jump by when panning the screen left of right..
Use this option to control whether or not long filenames will be shortened when they appear in the either the Recent Files, Recent Projects or Window menus. If this option is active, long file names will be shortened whenever they exceed 60 characters in length. Use this option to control whether or not the filenames displayed in Boxer's File Tabs will be shortened when they exceed a specified length. 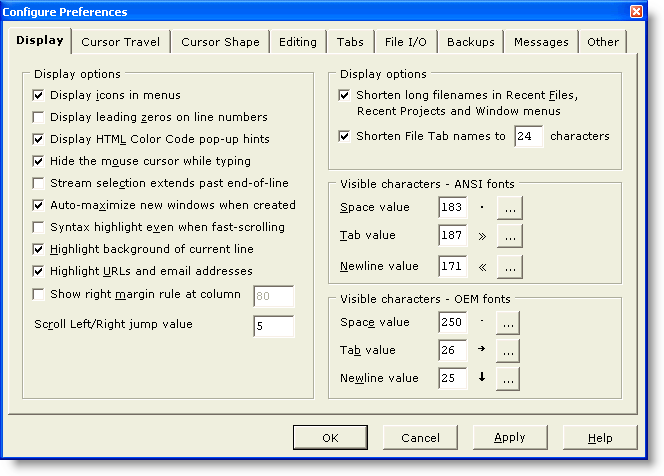 When filename shortening is required, as many as four characters will be reatined from the file extension, with the balance of characters being retained from the left side of the filename. Missing characters in the middle of the filename will be replaced by three dots (...). These options can be used to designate the characters which will be used for Visible Spaces display when an ANSI Screen Font is in use. Use the button with the ellipsis (...) to select a character from the ANSI Chart. These options can be used to designate the characters which will be used for Visible Spaces display when an OEM Screen Font is in use. Use the button with the ellipsis (...) to select a character from the OEM Chart.